What is the RELATIVITY OF CODE, ENERGY, AND MAsS? 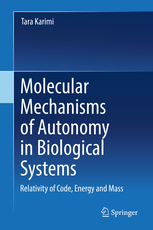 Enabled by the capability of information storage in molecules, The Relativity of Code, Energy, and Mass unveils the molecular logic behind several unknown features of nature, (such as natural molecular machinery and self-organization) and provides solutions for several challenges in different areas of technology and life sciences. This new translation of relativity equation explains that in nature, the matter is not limited to energy and mass, and the transformation is not limited only to energy and mass, but also includes code as an additional factor. We aren't just scientists, we are entreprenuers on a mission to put a dent in the universe. Tara Karimi, co-founder and chief executive officer of Cemvita, a company focused on developing biologically-inspired manufacturing solutions, spoke with BioSpace about the company and the amazing things it’s working on to solve problems for human exploration to deep space by in-situ biomanufacturing of human life supplies. "A few grams of biological media in a tube will replace a million sq-ft data center".